For the last three days our town has been sold out of pumpkins. This was a bit disappointing to my four year old son who was very much looking forward to getting a pumpkin and having it carved. 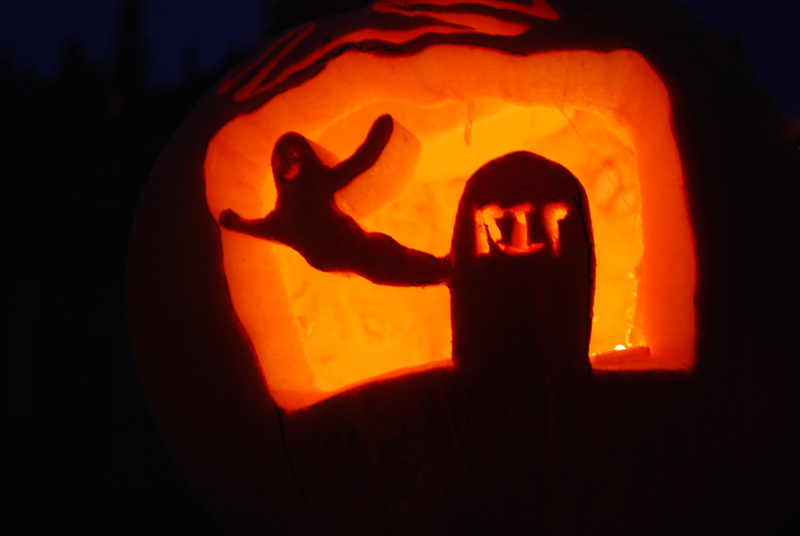 I was slightly disappointed as well since I have always enjoyed carving pumpkins, though admittedly I think my favorite part has always been digging out the innards. However, by chance today we ended up running to the grocery store for some milk and there outside was a large bin of pumpkins that had been delivered late last night. With great joy my son and I dug through the bin in search of the best pumpkins. The pickings were slim but we found two that would work and happily brought them home. He decided that he would like his to have a triceratops on it. 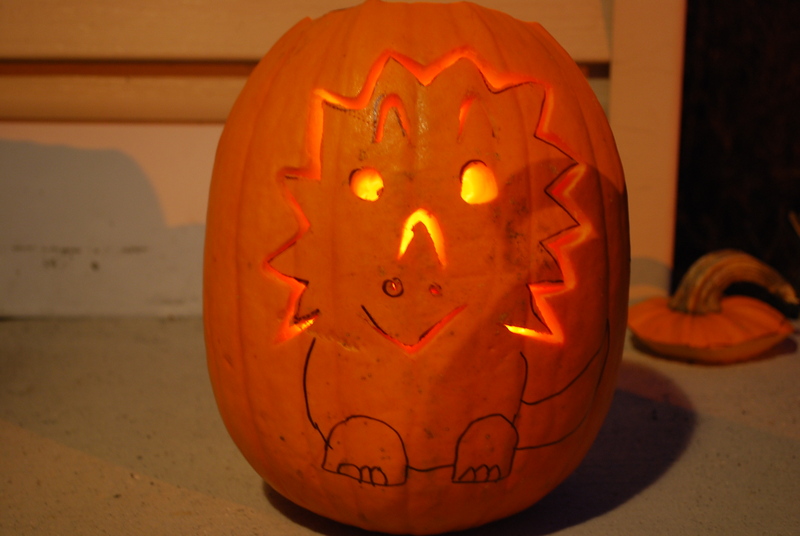 At first I thought it would be impossible, but with a bit of help from Google and a small dose of creativity I managed to make him a triceratops pumpkin that he was very happy with. The results of which can be seen below. It’s far from perfect however the fact that my son loves it is all that matters. After this I carved my own pumpkin. On it is a scene of two twisted trees, a headstone and a ghost coming out of it. These two pumpkins were my first attempts at carving something other than simple faces on them. I must admit I’m fairly happy with the results and look forward to creating something bigger and better next year. After tossing the pumpkins on our front steps we took our son trick or treating. That boy made out like a bandit. Went to about 30 houses and his bag was overflowing by the time we got home. He’s not a huge fan of candy, which is a good thing in my opinion, but he loved the fact that there were plenty of small bags of chips for him to snack on. It was a good end to a good and productive day. Of course now that Halloween is pretty much over that means that NaNoWriMo is only hours away. Yikes! Though I’ve had my prep work done for some time now I am still susceptible to the pre-NaNo gitters. Panic sets in and will likely remain for the first few days while I pound away at the keyboard. Yet as this panic fades away I am left with great satisfaction as I see my word count go up and up. So though I’m a little freaked out right now over the start of it all, I’m also tapping my finger upon the desk impatiently waiting for the stroke of midnight. Two hours and thirty four more minutes to go.